No, this novel isn’t a sweet, heartwarming Christmas tale; but you can compile and eat a sweet holiday meal out of this bestseller! There are not a whole lot of appetizers to work with on first glance; but I think it could be a neat idea to use the sandwhiches that are mentioned throughout the novel as hors d’oeuvres. Bite sized creations based on crostini instead of sliced bread. What do you think? I think this would work especially well for a rye crostini topped with a thin slice of hardboiled egg, cheese and a small spoonful of caviar. Decadent! Whatever District you hail from; I think we can all agree that during the holidays it’s ok to indulge like they do in the Capitol. The Hunger Games trilogy makes for a great dinner party theme because the food is versatile. It’s easy to go upscale for a lavish dinner party, or use your imagination and create a swank cocktail party (make sure to serve plenty of wine; you never know where Haymitch Abernathy will show up! ), and there is plenty of food if you would rather do a nice holiday buffet. No matter what choices you pick from the menus below, your guests will not go Hungry. For ease of your pick-and-choose, I’m listing out a general guide to appetizers, first courses, mains, sides and desserts. Additionally, I’ve come up with some suggested menus and provided references to the appropriate book in the trilogy. This is not an exhaustive list, so feel free to add if you think I forgot something party-worthy. The “Game of Thrones” series (A Song of Ice and Fire) by George R.R. Martin is a rare find. Where many writers leave us wanting more at “soup”, Martin often tells us in elaborate detail exactly what goes into a particular soup; including the spices. Martin is clearly a man who loves his food and drink, and God bless him for that. There is a lot of eye candy in his novels, and I’ll do my best over here to do him justice. So, hot crab pie. Close your eyes – what do you see? I’m torn; at first I see cutting into a browned, flakey crust to reveal a crabby version of a pot pie. Big chunks of crab meat, a gravy of sorts (and boy do I love gravy), maybe a few simple veggies. Hot, hearty and filling. Reminds us all that winter is indeed coming. On the other hand, Martin clearly has set the scene with “summer greens” and grape salad; the description of which takes the chill of winter away…for a time. What does a summer hot crab pie look like then? My grandfather (on my mother’s side) was a Colonel in the US Army through World War II and Korea – a career military man. One of his posts was to Alaska, and my mom, uncle and grandparents lived there for several years in the 1960’s. Astoundingly enough, or disappointingly enough, they could not see Russia from their backyard. My grandfather loved to fish and would often trade fish and crabs for moose meat with other men stationed there. One of my grandmother’s most famous dishes is her recipe for “crab casserole”, which is baked in a pie pan and served in pie shaped wedges. It’s lip-smacking good either hot or cold. (Do you see where I’m going with this?) It’s a fantastic light summer supper or hearty lunch, especially when paired with a salad. I can’t be sure what Martin saw when he wrote “hot crab pie”, but I think he would approve of this version nonetheless. Sautee onion and celery in a little butter or olive oil. Mix everything together and bake at 400 degrees for about 30 minutes, until golden brown on top and cooked through. 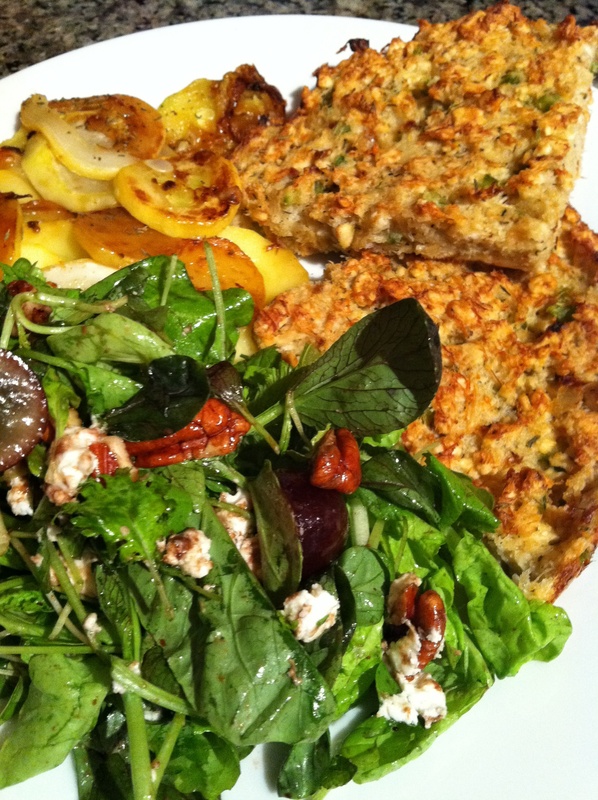 Get inventive….grapes, crumbled cheese, pecans and summer greens…. I used a mix of greens and goat cheese from our farmers market, some pecans and a simple balsamic/olive oil dressing. Summer squash sliced and sauteed up in a little butter and spiced to your liking. Or; that time I didn’t make Turkish Delight. If you ask a room full of people about what they remember about food in TLTWTW (why would you ever do that? ), you’ll hear a lot about Turkish Delight. I was read this series when I was just a wee glutton, and yes, I remember the Turkish Delight all these years later. Guess what, though? These is A LOT of other delicious food in TLTWTW! Like, Turkish Delight is only a twice-mentioned blip on the fresh-caught trout, toast, sardines, onions and hams hanging from ceilings, butter and high tea filled radar! Santa Claus even whips a full tea service out of thin air for Christ’s sake, because apparently that’s exactly what all good little British boys and girls want for Christmas. It’s funny; when the movies came out several years ago and there was all this blah blah blah about religion, I was all “lol wut?” because I remembered the novels being just a super cool fantasy land with an evil witch, good and not-so-good woodland creatures, a dude who was half deer, and a fabulous lion. Yeah…rereading them as an adult was a trip. How did I miss how overtly religious, and sexist these novels are?!?! They hold up though, and The Lion, The Witch and the Wardrobe was an immensely fun read. Chop potatoes into large chunks. Boil water, add potatoes and cook for about 15 minutes; or until just tender but not falling apart. While you cook the taters…. Cook bacon in large skillet (cast iron is great) over medium heat until crisp, about 8 minutes. Transfer to paper towels to drain. Crumble bacon. Pour off all but 3 tablespoons drippings from skillet. Add chopped leeks to pan. Sprinkle fish with salt and pepper. Coat flesh side of fish with flour; shake off excess. 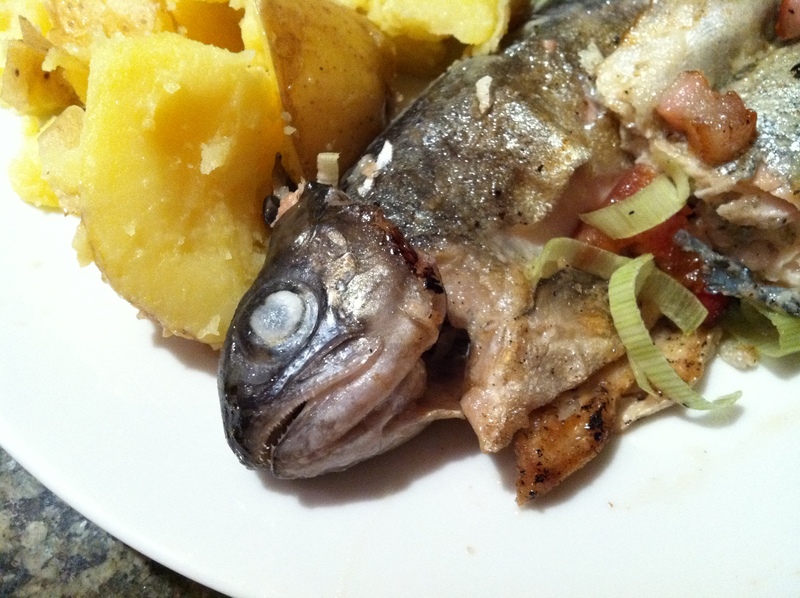 Add fish, flesh side down, to skillet. Cook 2 minutes. Turn fish over. Cook until just opaque in center, about 2-3 more minutes. Transfer cooked fish to two plates; dizzle with leeks and a bit of the bacon grease. Drain the potatoes, add to the plates and garnish liberally with butter, salt and pepper. Happy Halloween! (or, Halloween Eve). Here’s a great recipe to curl up with after shuttling your little goblins and ghouls up and down the neighborhood in search of the elusive full-size-candy-bar-giving-out-house. Our little one is going to be a ladybug this year; and since she’s too little to gum herself a Snickers, I plan to just go ahead and take one for the team and finish her candy for her; like the selfish selfless mama that I am. Dracula is the 1897 gothic horror novel by Bram Stoker; and it is a welcome refresh from some well…more sparklier and teen-angst filled versions of the genre. Its a fantastically spooky read; and if you want to go ahead and picture Gary Oldman as the Count while you read, well, don’t worry; you won’t be the only one. My favorite character in Dracula (and one of my favorites in all of literature) is Mrs. Mina Harker. What a heroine! Described as having a “man’s brain”, she is definitely binder-worthy. She earns her own income prior to marriage and is well educated. She keeps up with her husband’s law studies at night for the fun of it, after working all day. For the fun of it, people. Both she and her opinion were respected and valued. Also, Quincy Morris? Aw yeah, he’s an American all right! Me likey. So, onto our recipe then. 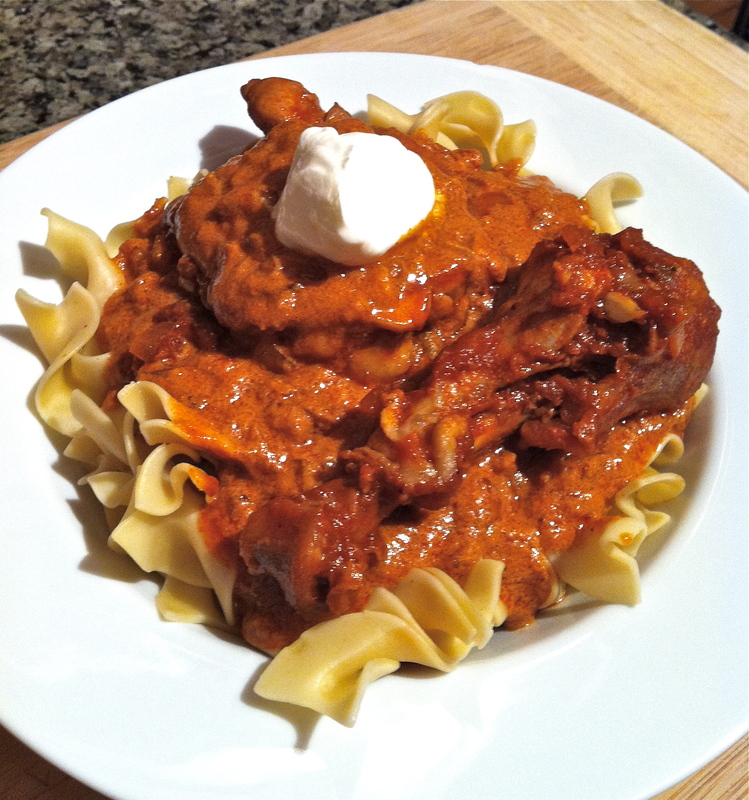 I went about internet sleuthing (my favorite way to sleuth) to determine exactly what paprika hendl was, and compared German, Romanian and Hungarian chicken dishes. I think this is probably a fair representation of what J.H. dined on on his way to Castle Dracula. This dish is warm, comforting and heavy on the garlic; which are all good things, especially if you are on your way to chat London real estate with the undead. Brown the chicken in a deep skillet under the fat begins to render; then remove from the skillet and remove remaining skin. Set chicken aside. Add the onion to the skillet and cook over medium heat until translucent. Add the garlic and cook for just a minute or two. Remove skillet from heat and stir in paprika. The paprika will darker and release some oil – this is what we want! Add the tomato puree, bring to a simmer. Add the chicken back in, cover and cook for about 30-40 minutes (until chicken is cooked). Remove from heat, fold in majority of the sour cream – reserve several spoonfuls for garnish – and serve over egg noodles, dumplings or potatoes. Top with a spoon of sour cream and dig in. The onions, garlic and paprika, melting together…..
– Part I: The Tributes, Chapter 1. The Hunger Games is an embarrassment of riches for me. Between the constant fight against starvation in District 12 and the over-the-top culinary indulgence of the Capitol; almost every chapter brings us a new meal. There will be many posts dedicated to this trilogy; as we have much to eat. In this meal in the novel; Katniss trades for her bakery bread, so in the spirit of the novel;, I did the same. I traded some money for bread, and I think both I and the Standard Baking Company made out like Greasy Sae at the Hob. Use a hearty green like kale, collard greens or chard that can stand up to a good simmer. The last thing you want is to spend all afternoon at the Reaping, crossing your fingers your children don’t get seleced to battle to the death and then return home to a stew full of sickly greens. No bueno. We know that potato-like tubers grow in District 12; as Katniss is named after them. It seems to me that if the terrain and atmosphere of District 12 support tubers and wild strawberries; you might also be able to find some member of the wild onion family growing. Wild leeks grow well in much of the coal-rich Appalachian areas f today; so let’s include them in our stew. Coming from New England; many people’s first thought upon hearing “fosh stew” would be a chowder – but I don’t see that. Although the Everdeen gals have access to milk thanks to Prim’s goat; I just can’t imagine Katniss indulging so many resources in one meal – even a celebratory one. She is ever aware that she has a family to feed and provide for every day of the year; not just on the evening of the Reaping. 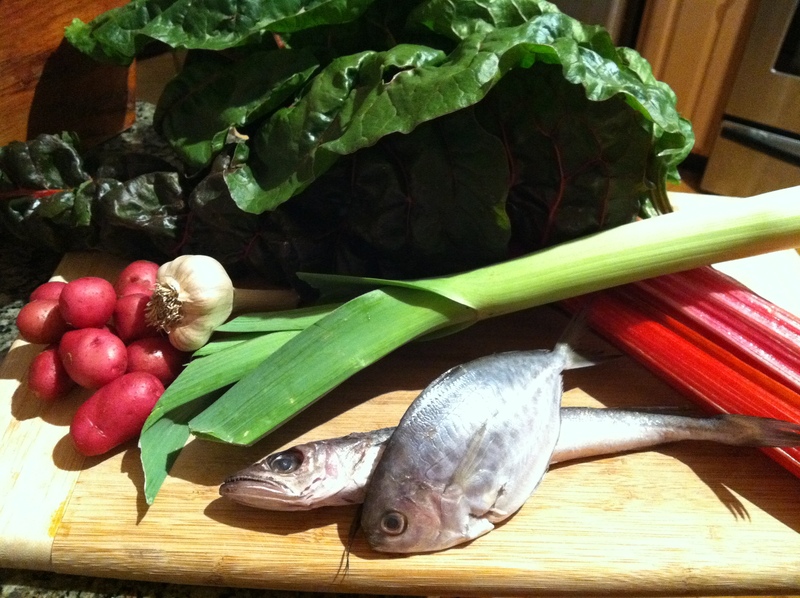 So, what I envision is a very simple fish stew made with fish, whatever sort of greens you can find groing in your District, and perhaps small quantities of tuber (potatoes for most), onion or leek, and garlic. In a soup pot, warm the stock and water while, in a separate pan, you saute the leeks and garlic in a bit of olive oil or butter just until fragrant – take care not to burn the garlic. When they are done, add to the stock. Season to taste with choice of herbs, salt and pepper. Add in your potatoes and greens and simmer for about 30 minutes; until potatoes and greens are tender. 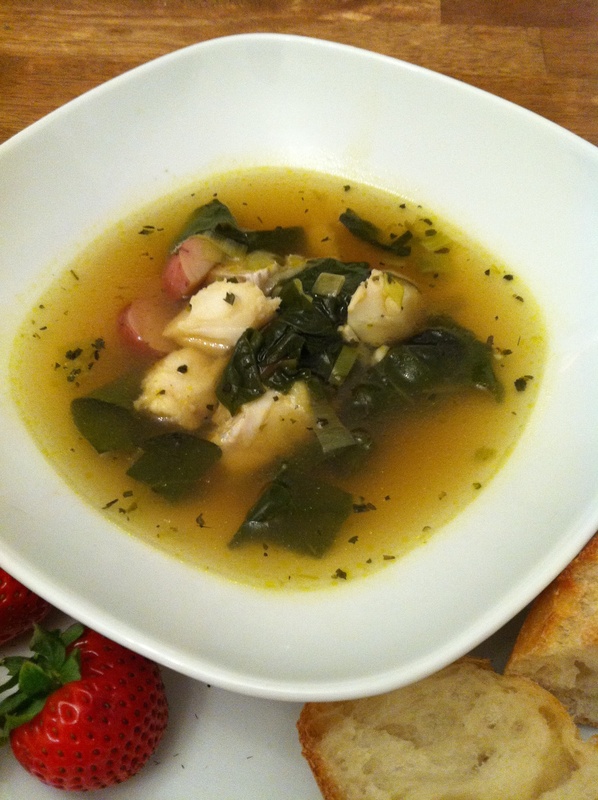 Add fish to simmering stock; cook until fish is just cooked through (just a few minutes), then turn off heat. Serve with warm bakery bread and wild strawberries. Hug your children. “His legs were stretched wide apart, and betwixt his knees he held a great pasty compounded of juicy meats of divers kinds made savory with tender young onions, both meat and onions being mingled with a good rich gravy. In his right fist he held a great piece of brown crust at which he munched sturdily, and every now and then he thrust his left hand into the pie and drew it forth full of meat; anon he would take a mighty pull at a great bottle of Malmsey that lay beside him. Meat, tender onions, thick gravy and flakey pie crust – there’s not much better on a rainy day to make one merry. In this dish, you’ll make your gravy from beef stock and thicken it with a bit of flour. Do not purchase premade gravy; gravy out of a can or jar has no place in polite society. “Meats of drivers kinds” simply refers to a pie made with different (multiple) types of meats. You can use whatever meats tickle your fancy. I wanted to use a combination of beef and venison, but was unable to locate any venison. I thought about using bison as I think bison would provide an interesting flavor; even if it’s terribly unlikely that you would run into a bison in Sherwood Forest. So, the choice is yours. Malmsey is a sweet Madeira wine. I opted not to take mighty pulls at a great bottle of Malmsey as very sweet wines are one of the very, very few food or drink items I just can’t abide. I stuck with a bold red wine instead, which seemed to be within the general spirit, and which I doubt our friend the Friar would have turned his nose up at. So, go steal from the rich and give to the poor (disclaimer: don’t steal from anyone, please – but the social responsibility bit is still good!) and get your merry on with some meat pie and brown bread. Cut your meat into roughly bite size pieces, and chop onion. Heat a deep skillet/dutch oven over medium heat, and cost pan with olive oil. Coat your meat in the flour, and when the pan is hot, add them eat to the pan. 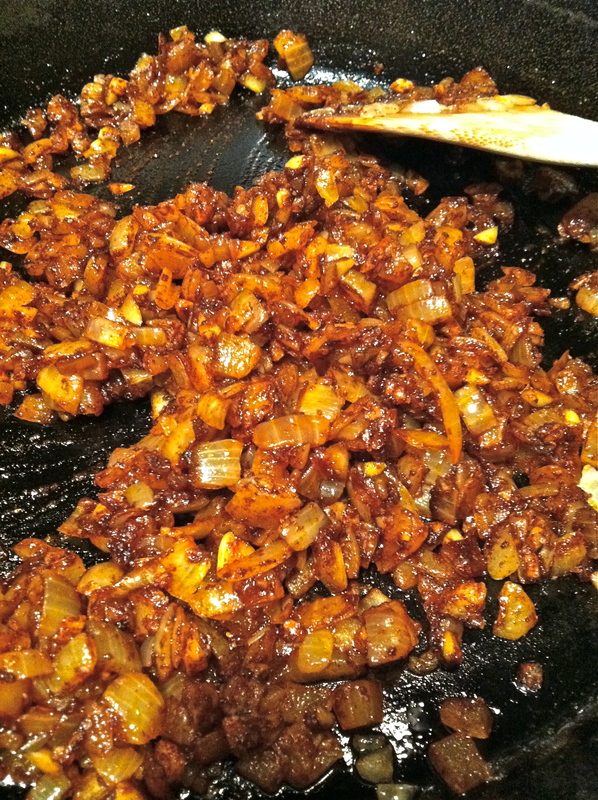 Brown meat on each side, then add onions and turn heat down to a medium-low as not to burn the onions. Cook onions until translucent, then add in your beef stock. Stir to combine and let simmer for several minutes to start to thicken sauce a bit. Place 1 pie crust into a pie pan, pour in your meat/onion/gravy mixture, and cover with second pie crust. Pinch crust edges closed and make a couple of small slits on the top of the crust to act as air vents for your pie. Bake pie for approximately 1 hour, or until your crust is brown and delicious looking! In a bowl, mix all-purpose flour, sugar, baking soda, baking powder and salt. With a pastry blender or 2 knives, cut in the butter until mixture forms crumbs. Stir in whole-wheat flour and oats. Add yogurt, stir to combine. If mixture is too dry to hold together, add in milk (about a tablespoon at a time), just until the mixture holds together. You don’t want sticky dough. Place dough on a lightly floured board and knead gently about 5 times to make a ball. Set ball on a lightly greased baking sheet and pat to form a nice loaf. Cut an X into the top of the loaf with a floured knife. Bake until well browned; about 45 minutes. Serve warm or room temp.